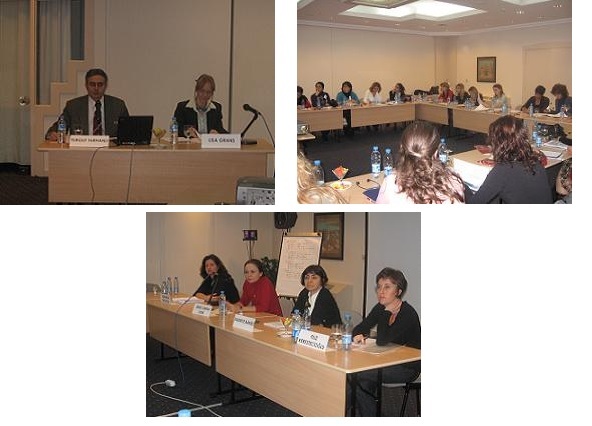 The third training of the project "Strengthening Respect for Human Rights of Women in Turkey", conducted by Istanbul Bilgi University Human Rights Law Research Center and supported by Raoul Wallenberg Institute of Human Rights and Humanitarian Law and Swedish International Development Cooperation Agency, was held between 23-27 November 2006 in Istanbul. The training seminar lasted for five days and 23 lawyers from the bars of Ağrı, Batman, Bingöl, Diyarbakır, Elazığ, Erzincan, Erzurum, Gaziantep, Hakkari, Kars, Mardin, Ordu, Rize, Sinop, Şırnak, Trabzon, Şanlıurfa, Yozgat. The local experts were selected by Bilgi University and the international expert was selected by RWI. The local experts were Assoc. Prof. Bertil Emrah Oder (Istanbul University, Faculty of Law), Assoc. Prof. Kadriye Bakırcı, Istanbul Technical University, Faculty of Management, Assistant Professor Dolunay Özbek (Istanbul Bilgi University, Faculty of Law), Ms Asuman Aytekin İnceoğlu, LLM, Istanbul Bilgi University Faculty of Law and Ms Filiz Kerestecioğlu, Member of Istanbul Bar Association. The international expert was Dr Miriam Estrada-Castillo, Legal and Political Adviser, United Nations, NY.